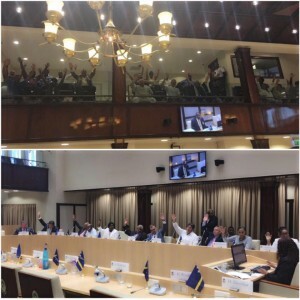 WILLEMSTAD - The majority of 12 adopted ten motions during yesterday’s public meeting of parliament. These motions range from no more addition of fluoride to drinking water, the elimination of the one guilder payment for each prescription, and reconnecting people to the water network supply. According to one of the motions that were adopted yesterday, in the future fluoride will be no longer added to drinking water. Approximately 95 percent of the population has dental problems and there is a desire to stop adding fluoride to the water, according to the Members of Parliament. The government should arrange dental care within six weeks for all the people who are entitled to medical care in the basic insurance. At the same time, the government should start a campaign to increase public awareness of the importance of proper care of the teeth. The government of Curacao should demand from the local utility company Aqualectra to immediately stop the addition of fluoride to drinking water. The problem of people whose water has been cut off is the basis of another motion. In consideration, the majority of citizens have a right to drinking water. If they are deprived of water it affects their quality of life and their dignity. The government should instruct Aqualectra to reconnect all citizens who have been cut off from the water network. A “Paga Tinu” system (pre-payment system) will be introduced for water and will have to be lower tariffs for water and electricity. To solve the unemployment problem, a motion has been adopted which should make it more attractive to set up a business. In the future, companies must receive all their paperwork back from the government within six weeks. Also, the government will have to create 1,000 jobs a year. To boost the tourism industry, a motion has been adopted to exempt all products intended for tourism from government taxes.